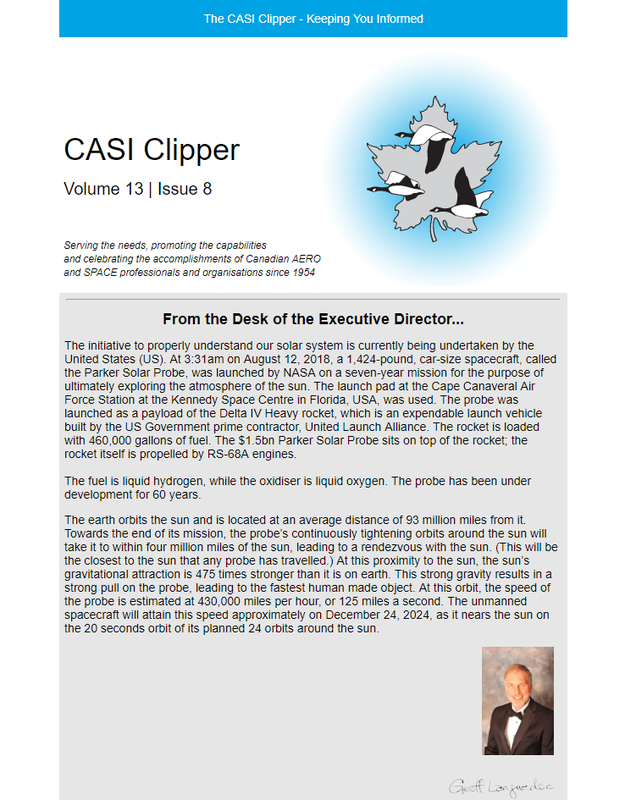 The CASI Clipper is an electronic newsletter that informs our Members and Corporate Partners about what is going on in the aeronautics, space and related communities. It also provides frequent updates about CASI conferences, events, Branch meetings and other activities. The e-zine is just one of the many benefits of membership in CASI. If you are interested in receiving the Clipper, please visit our Membership section to find out about becoming a member. We are always looking for contributions and input, so please contact CASI if you have an item you think will interest our readers! The Canadian Aeronautics and Space Journal (CASJ) is the official journal of CASI. The CASJ is devoted to the timely reporting of fundamental and applied research, new technologies and other developments in the aerospace sciences and related fields to the international community. The Editorial Board will consider publishing material ranging from advanced theoretical treatises to the dissemination of experimental results, as well as book reviews and abstracts of recent reports and publications of Canadian aerospace research organizations. All manuscripts require favourable peer review prior to publication. In addition to the dissemination of the technical material published in the Canadian Aeronautics and Space Journal through its member, institutional and complementary subscriptions, the material published in the CASJ is also represented in the AIAA Aerospace and High Technology database, the Cambridge Scientific Abstracts Mechanical Engineering and Transportation Abstracts database, the Cambridge Scientific Abstracts Civil Engineering Abstracts, the Engineering Information Inc. Compendex and the National Research Council – CISTI Source. For all manuscript submissions and reviews, please visit the CASJ Manuscript Central website. To view the CASJ Electronic Journals online, please visit the Canadian Science Publishing site at http://pubs.casi.ca/journal/casj (You must be a member or subscriber of CASI). The cost of producing the Journal is offset partially by a publication fee paid by the lead author of $125 CDN per page. The author will be invoiced after the paper has been accepted but prior to it being published. Any over-payments or under-payments will be handled accordingly. Upon payment and publication of the article, the lead author will receive a hard copy of the Journal issue in which the manuscript appears and a PDF file of the final, formatted, manuscript. Additional copies of the Journal may be purchased by prior arrangement with CASI. Published by Taylor and Francis Online: The Canadian Journal of Remote Sensing /Journal canadien de télédétection is a publication of the Canadian Aeronautics and Space Institute (CASI) and the official journal of the Canadian Remote Sensing Society (CRSS-SCT). 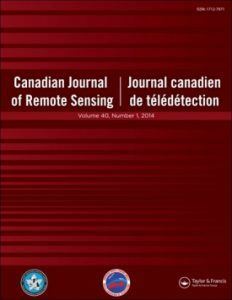 The Canadian Journal of Remote Sensing provides a forum for the publication of scientific research and review articles. The journal publishes topics including sensor and algorithm development, image processing techniques and advances focused on a wide range of remote sensing applications including, but not restricted to; forestry and agriculture, ecology, hydrology and water resources, oceans and ice, geology, urban, atmosphere, and environmental science. Articles can cover local to global scales and can be directly relevant to the Canadian, or equally important, the international community. The international editorial board provides expertise in a wide range of remote sensing theory and applications. Articles can be published in English or French. All papers are published with an abstract in both languages. All manuscripts require favourable peer review prior to acceptance for publication. For regular issue Research Articles and Review Articles, we have a working goal of less than one year between initial submission and publication. For regular issue Research Notes and Technical Notes, we have a working goal of less than eight months between initial submission and publication. This requires timely and constructive response from both the reviewers and the author. The Canadian Journal of Remote Sensing has page charges of $400 USD per paper for review and research papers, and $300 USD for research notes (less than 4 printed pages). Please visit Taylor and Francis Online for Instructions for Authors. To purchase this journal, please visit Taylor and Francis. For all manuscript submissions and reviews, please visit the CJRS Manuscript Central website. Review, contribute to, and lead initiatives such as development of plans for electronic publication, development of Editorial Board policies, etc. Comment upon and approve all Special Issue proposals. Recommend a winner for the CJRS Prize Paper Award to the CRSS Awards Committee, and prepare a citation. A Guest Editor leads a Special Collection initiative by invitation or proposal. All Special Collection projects are subject to approval by the Editorial Board. Special Collections could be published as a dedicated Special Issue or as a Special Section within an issue. Content may be derived from Canadian Remote Sensing Society symposia, workshops or symposia of appropriate subject matter, or collected thematic papers in an individual’s area of expertise. In order to maintain reader interest and scientific impact, Special Collections should maintain a rapid publication schedule, with a goal of one year between initial announcement and publication. Guest Editors are usually responsible for all aspects of the review process for their particular Special Collection initiative, including the solicitation of manuscripts, the selection of reviewers, communications with reviewers and authors, publication decisions, and maintenance of the publication schedule. These functions can be carried out in collaboration with other members of the Editorial Board and CASI Headquarters staff. Adequate records must be kept to justify the process and decisions taken. The reviews will be based upon the usual CJRS Manuscript Review Form. In addition to overseeing the peer-review process, Guest Editors should prepare a directed call for papers as well as the preface for their Special Collection. They should also usually select a cover figure and provide an appropriate caption. For scheduling purposes, Guest Editors should maintain regular communication with the Editor in order to provide up-to-date schedule and content information. This facilitates planning and maintenance of the publication cycle. The CJRS peer review process is anonymous unless otherwise requested by the reviewer. Reviewers are selected according to their expertise in the field of the submitted paper and, as much as possible, on their past performance in providing a timely and serious review. Their task is twofold: to determine whether the paper under review has any serious technical or theoretical flaws, and then to judge its originality in terms of research risk. This is facilitated through completion of the CJRS Manuscript Review Form and by providing detailed constructive comments for the author’s benefit and to improve the paper. It should be noted that a detailed review of grammar and style is not essential since a qualified technical editor edits all accepted manuscripts. The usual time frame to complete a review is four weeks after receipt of the review package (except for Research Notes for which we request a two-week turnaround). Reviewers are always contacted in advance via e-mail to ensure that the topic is relevant to their field of expertise and that the required time frame can be met. They should immediately contact the Editor if they find that they will be unable to meet the deadline date. Whenever possible, we request that reviews be returned via e-mail or fax. Reviewers should be aware of the types of papers published in CJRS; it is within their mandate to re-categorize a paper that does not meet the appropriate standards. The Canadian Remote Sensing Society and the Editorial Board are greatly indebted to those individuals who spend the time and effort to provide a conscientious review. This is a significant task that goes largely unrewarded and can only be justified given the individual reviewer’s dedication to the pursuit of scientific quality. As an acknowledgement, we list the reviewers’ names annually in the final issue of each Volume. All papers published in CJRS are subject to peer review by at least two reviewers. There are four main types of papers that are considered for publication. A Research Article is the most common type of manuscript submitted to CJRS. Peer-reviewed research in remote sensing applications and methodology involves original contributions that apply the scientific method to new problems involving the acquisition, processing, validation, and interpretation of remotely sensed data and/or its application within a geographic context. These contributions must be more than a collection of accepted or previously published facts: they must be the proof or rejection of a hypothesis; research risk must be involved. In observational sciences such as remote sensing, the risk may be difficult to perceive since papers might test or compare known or previously published methods on new or old data sets, or might consider new sensors of fundamentally similar design. In these cases, the acid test for peer reviewed approval is whether the authors (i) apply appropriate, pertinent, and innovative testing/evaluation procedures or tools and (ii) provide methodological or applications insight which enhances understanding beyond a mere observational presentation of data. A Research Note is usually a shorter contribution than a Research Article. They are normally comprised of up to 6 double-spaced pages with up to 4 accompanying figures. This is original work which shows potential and innovation, but where it may be too early to perform a comprehensive validation. We strive for rapid publication of Research Notes, and we encourage the electronic submission of papers in this category, preferably via e-mail. All interactions with the author and reviewers are via e-mail. A Review Paper is a review of an application or methodology that is normally made by a senior researcher who has the capacity to analyze the theoretical and experimental ramifications of previous research with a global perspective. This unique viewpoint should contribute to a clear understanding and synthesis of past work and provide innovative guidelines as to which directions future research should or will take. Typically it should delineate (or extrapolate to) an algorithm, methodology, or process that best synthesizes and generalizes previous work. This type of contribution is not intended to be a bibliographic summary or a tutorial. It is also not intended as a forum for reviewing remote sensing policy issues or for projecting organizational trends. A Technical Note may include, for example, the technical specifications of hardware or software systems, critiques or corrections of past papers, book or thesis reviews, bibliographic summaries, market surveys, tutorials, and case studies. All of the papers presented at our events are available in Proceedings published in CD-ROM, DVD format or on an FTP site. Older Proceedings are available in bound-volume format. 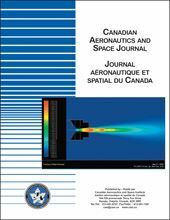 Back issues of the Canadian Aeronautics and Space Journal and the Canadian Journal of Remote Sensing are also available. Articles are $10.00 each. All CD’s (DVD’s and access to the FTP site) are $49.95 (plus applicable taxes and shipping).